It's been a great year, but there's is much work to do to prepare for local races in 2019. Nashville will elect a new mayor in August 2019. Come meet and hear from Birmingham's youngest and most progressive mayor elected in 2017 on why we MUST build political power in Nashville. get exclusive access to our VIP Power Player Hour from 4:00 - 5:00 pm. Enjoy an open bar, food, music, and an intimate hour with our special guest. receive their name listed on the Host Committee. receive general admission to the Power Hour at 5:30 pm. Cash bar. Randall L. Woodfin was sworn in as the 30th mayor of Birmingham, Alabama on Nov. 28, 2017, becoming the youngest in history to do so. 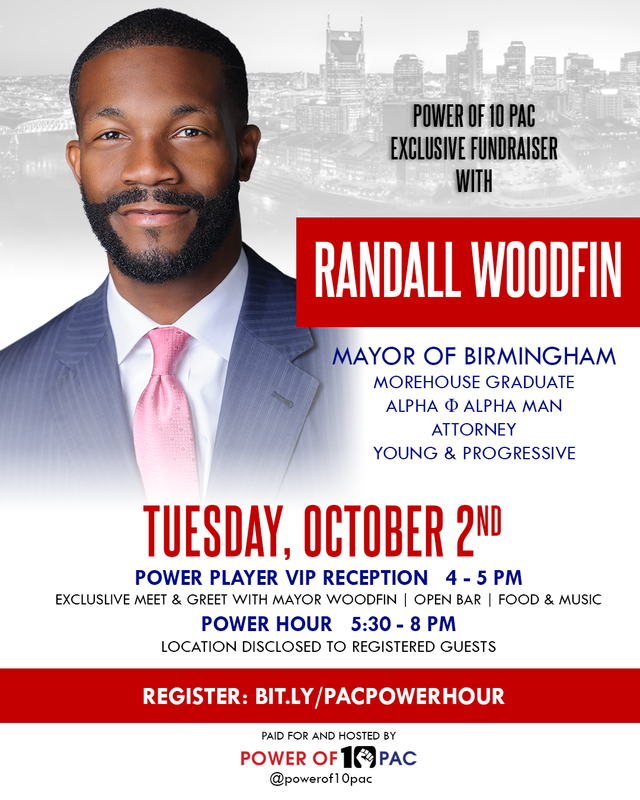 A Morehouse graduate, native of Birmingham and graduate of Cumberland School of Law, Mayor Woodfin is an attorney and former president of the Birmingham Board of Education. Throughout his career, he has worked in various positions for the City of Birmingham.